Recommendations by the Six Amendment Center in Boston include creation of a public defenders' office for Cumberland County. A Boston-based nonprofit group charged with assessing Maine’s public criminal defense system has urged state lawmakers to fund a Cumberland County public defender office and a statewide office that would assist indigent criminal defendants in their appeals. The eport by Sixth Amendment Center to the Maine Legislative Council, which ordered the study. Maine is the only state where all criminal defendants who can’t afford to hire an attorney are represented by private lawyers in state courts. The Sixth Amendment Center presented its full findings with eight recommendations Thursday before the Legislature’s Committee on Judiciary. Members later tasked the committee’s analyst with dividing the report’s recommendations into those with a fiscal note and those that would only require statutory language. That analyst also is expected to craft proposals as to how the center’s recommendations might be bundled into various bills for the committee to consider. In its report, the center also suggested beefing up supervision and training of court-appointed attorneys and boosting their hourly pay from $60 to $100 per hour. An additional hourly fee of $25 should be paid to those attorneys handling cases requiring a greater level of expertise, such as murder and sexual assaults, according to the report. 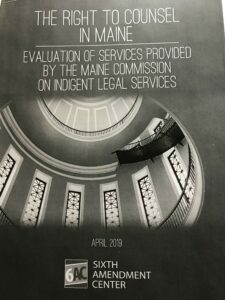 The Maine Commission on Indigent Legal Services, with a staff of three, oversees nearly 600 defense attorneys who handle cases in 47 courthouses throughout the state. The commission is responsible for maintaining the rosters and providing payment. In 2017, the Legislature created a study group that recommended an independent assessment of the state’s indigent legal services. Roughly a year ago, the Maine Legislative Council contracted with the center to evaluate right-to-counsel services provided by the commission and to recommend any needed changes. That evaluation focused on five counties, including Androscoggin and Cumberland. Attorneys who take court-appointed criminal cases in Androscoggin County seemed ambivalent about the center’s findings and recommendations. Allan Lobozzo, a Lewiston defense attorney who used to take court-appointed cases, and who called the report “an indictment of the existing system,” echoed Hess’ sentiments that the best attorneys should be culled from the too-large roster and they should be paid according to their abilities. All attorneys interviewed by the Sun Journal agreed that the hourly rate is far too low and should reflect the level of difficulty of the case. “It seems ridiculous that I get paid $60 an hour for a murder case and I get $60 an hour for reviewing discovery in an (operating under the influence) case,” said James Howaniec, a criminal defense attorney with more than 30 years of trial experience who had recommended to the Legislature that court-appointed attorneys be paid more. He serves as a mentor to some of the less-experienced attorneys on the roster. Although most agreed that the roster of approved court-appointed attorneys should be shortened and that lawyers should be subjected to more vigorous vetting, several of those attorneys who have more than a decade of criminal defense experience said the report fails to acknowledge the bargain gained by Maine’s indigent defense system with the participation of many highly trained, experienced and effective criminal trial lawyers who treat court-appointed cases as a public service. Those attorneys would be a significant loss if the state were to transition to a public defender system, they said. “There are a lot of good, qualified lawyers who are doing this work because they enjoy it and because they believe in the system and not just for the money,” Lewiston attorney Verne Paradie said. Howaniec and others said a public defender system probably would cost more and provide fewer highly experienced lawyers. Hess said a public defender system in Cumberland County might bring to those court-appointed attorneys an added level of power and authority, something that’s lacking with the current program that plucks private attorneys from a list and connects them to indigent defendants. None of the lawyers interviewed was hopeful that the Legislature was likely to hike the commission’s budget to provide higher hourly rates for deserving court-appointed counsel. Some of the report’s findings were welcomed by defense attorneys who acknowledged some cracks in the system. The center suggested the commission that oversees and pays court-appointed attorneys should not also be responsible for determining defendants’ financial eligibility for publicly funded legal counsel. The same lawyer should be representing a defendant all the way through the judicial process, starting with that defendant’s initial court appearance, according to the report. The center pointed to flaws in Somerset County, where court-appointed attorneys are contracted at a fixed fee to handle an unspecified number of cases. That method appeared to “create financial incentives for a lawyer to dispose of cases as quickly as possible, rather than effectively as possible for the client,” according to the report. The average hourly rate in that county worked out to nearly $175 per hour in fiscal year 2017, almost three times the hourly rate paid to attorneys in other counties, while putting in fewer hours per case. One of the report’s findings was that “a significant number of attorneys bill in excess of eight hours per day, five days a week, for 52 weeks per year,” leading to suspicions of “overbilling.” The commission doesn’t require court-appointed attorneys to submit billing vouchers under the penalty of perjury and the office doesn’t conduct audits, according to the report. In 2018, 25 attorneys on the commission’s roster billed that office more than 40 hours per week; the top biller, more than 88 hours per week.